Well it has been a couple of months since Celie Fago announced her latest ‘discovery’; namely by combining equal amounts of PMC3 and PMC Sterling, you create a new clay which has more strength and durability like Sterling but does not require the pesky 2 stage firing that Sterling does. This may seem a little bit daunting, especially if like me, you have always shied away from handling the clay too much when you are making, for fear of drying out the clay too quickly. However, the clay doesn’t seem to mind this sort of handling. I usually use the 25g packs and combine them straight from the packet. You will find the Sterling clay stiffer and harder than the PMC3, but that’s normal, so don’t worry. Firmly mash the two clays together with your fingertips, like you would combine Siligum or any other 2 part moulding putty. You are looking to get rid of the marbling effect and have one uniform colour, so be firm – don’t roll it between your palms, that just won’t cut it, kneading between your fingertips is what’s required. It shouldn’t take any more than a couple of minutes to get to that point. Once you’re there, wrap it up in some cling film and put in an airtight container for a wee rest for about an hour. If you think it’s looking a bit dry, then you can add some water before you set aside. It is much more forgiving and doesn’t dry out as quickly as PMC3 – which means more working time with wet clay. It also meant that I could roll it out multiple times without it drying out, which made me more relaxed when I wasn’t happy with a shape or texture. It is really, really easy to carve, it’s so soft and when you’re carving it seems like the scribing tool just cuts through so smoothly. You can use PMC3 syringe with it, no problem. When you need a little bit of decoration or something to join two pieces together, the PMC3 syringe works just fine. Well I guess this clay still needs to be kiln fired, so it may not appeal to those of you who are still hand firing – although you are welcome to use our Kiln Firing Services. It should be fired at 860oC for 1 hour, but I have to confess that I mistakenly fired one piece at 900oC for 2 hours and there were no ill effects. When your PMC 960 pieces come out of the kiln, you will notice a difference in the fired colour; it’s not the lovely bright glittery white you might expect it is a more subdued dove grey colour. But where I would pickle my Sterling silver pieces post firing, I don’t have to do that with the 960 version, it goes straight into the tumbler for polishing. 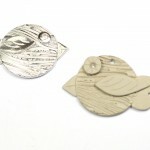 What’s also great about this version of silver clay 960, is that it can be hallmarked. There is a version of silver out there called Britannia silver which fits mid way between fine (999) and Sterling (925) at 958 parts silver to 42 parts copper. 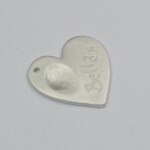 The mix of silver clay 960 would fit into this Britannia silver category. So what do you think? Have you used it? Remember that we are doing special priced combination packs at the moment, but it is a limited offer and will be discontinued on Friday 30th May. And if you have any questions regarding anything related to silver metal clay, please feel free to ask! We are more than happy to answer your questions! Birds made with PMC 960. One is fired and the other one is ready for firing. Shows shrinkage.